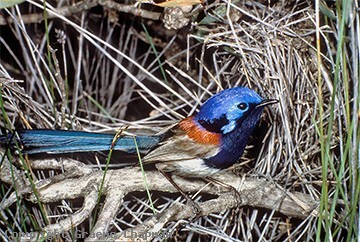 Blue-breasted Fairy-wrens inhabit the drier heathlands of W.A. and S.A. Even though the huge W.A.wheat belt engulfs much of their range in W.A. they are still scattered in pockets of relict vegetation throughout that area. Fortunately the country around the many granite tors is unsuitable for broadscale ploughing and the associated heaths (see 540207) are a favoured habitat. In addition to this, BBFW occur in several of the larger national parks of the south-west including Kalbarri, Stirling Ranges, Fitzgerald and the easiest place of all to see them, Dryandra Forest only 170 km SE of Perth. They also extend eastwards along the southern coast from just east of Albany as far as Eyre Bird Observatory and Eucla. 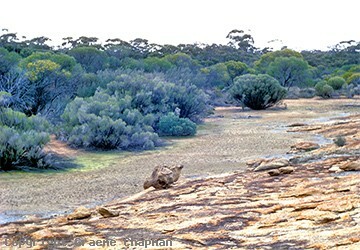 Further east in S.A. they occur on Eyre Peninsula right up to the foot of the Gawler Ranges where they occur in a variety of habitats including mallee. 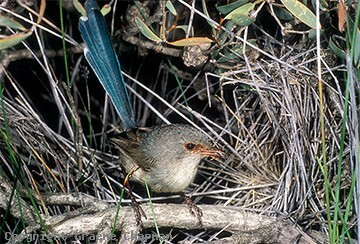 They overlap with Variegated Fairy-wrens in parts of their range although not usually in the same habitat. The blue breast of males can look quite black (like a Variegated) in some light; some published photographs taken with electronic flash exaggerate the blue considerably. 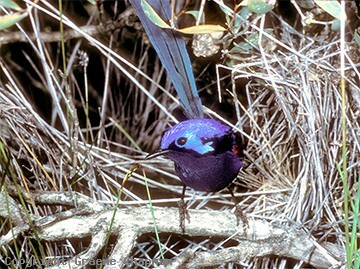 In particular many male Blue-breasted Fairy-wrens from Eyre Peninsula in South Australia have darker, almost black, breasts than birds from W.A. and this has led to quite a bit of misidentification. At one time they were even named as a subspecies "eyrei" of the Variegated Fairy-Wren. Female Blue-breasteds are not as dark around the eyes as Variegateds and they have a brownish bill - for side by side pics, see under Fairy-wrens W.A. females. The calls are one of the best clues. BBFW have a much softer, shorter song than Variegateds and their alarm calls lack the penetrating tzt quality so characteristic of the Variegated. 540201 ... Blue-breasted Fairy-wren, male, Manmanning, W.A. 540202 ... Blue-breasted Fairy-wren, female, Manmanning, W.A. 540203 ... Unless viewed in good light, the breast can look almost black. 540207 ... Ideal habitat - heathland in granite country.